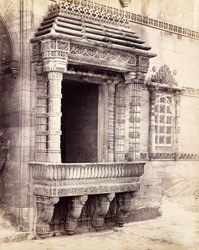 Photograph of a balcony window in Rani Rupavati's Mosque (Queen's Mosque) at Ahmadabad in Gujarat, taken by Henry Cousens in the 1880s, from the Archaeological Survey of India. This mosque was probably built during the reign of Sultan Muzaffar Shah (r.1511-26). The roof has three domes in line with the entrances; the central dome is raised a storey higher. The entrance arch is flanked by the truncated remains of minarets which collapsed in the earthquake of 1819. Much of the mosque is embellished with carving, including the minarets and windows. This photograph shows one of the balcony windows with intricate carving on the sills, brackets, pillars and roof.